Sonia Jones is a wellness advocate, impact philanthropist, and cofounder of Sonima Wellness, the Sonima Foundation, and The Contemplative Sciences Center at the University of Virginia. 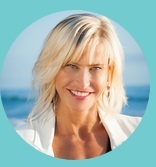 Her passion is achieving meaningful change in global communities by sharing best practices in health and wellness. The Sonima Foundation has contributed to the development and implementation of health and wellness curriculum in underserved communities and charter schools reaching over 50,000 K-12 students across the country. Parenting and caretaking. Along with caretaking, I encourage and convince people to take active control of their own health and wellness. My tenacity, my focus, and my earnest desire to see people become the best they can, physically and mentally. By doing the things that make me feel the best, including yoga, meditation, and eating well, then by using my best self to focus on others becoming their best selves. Personal: To be happy and fulfilled, both of which are achieved by helping others. Business: To see Sonima’s message spread far and wide. Not for Sonima’s sake, but for the sake of the people who hear and then act upon the message of health and wellness. Human behavior—especially the line between people who are engaged in helping themselves and those who are not. When I’m happy and at peace with myself, anywhere. When I’m not, nowhere.